I don't cook pork a lot. But when I do, I usually stick to the same 3 ways of preparing it: in the crock pot with sauerkraut, in the crock pot with bbq sauce, or fried or oven pork chops. I found this recipe while searching allrecipes.com for a slow cooker recipe for pork that only called for a few ingredients. As usual, I made a few changes to the recipe in order to avoid a trip to the grocery store! The cooking time on the original recipe was longer than it took for mine to cook. Sometimes I think my crock pot cooks faster than most. I was able to slice it, when usually when I cook pork, it just shreds. 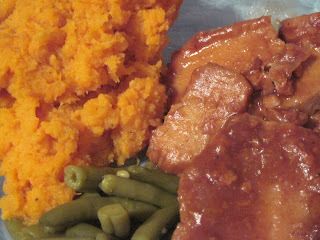 I served with mashed sweet potatoes and green beans. The sauce ingredients sounded very odd to me, but I was willing to try it after reading the reviews of the original recipe. I liked it enough to make it again, but it's not an absolute favorite. I think I will try it again using FRENCH dressing as stated, rather than the Catalina that I had in my fridge. I love allrecipes.com. I find many good ones on there and love my virtual recipe box that sends me the directions through e-mail. Very handy. I am always looking for more pork recipes myself. I have all these ingredients on hand so I should try it. We do a lot of pork tenderloin with some thyme and rosemary potatoes tossed with olive oil. I always need applesauce! Mini Veggie Trays: great for lunch or snacking!